Who will be the UK’s European Capital of Culture in 2023? Updated June 2016 with news on bidding cities and the selection in Croatia for ECOC2020. Updated August 2015 to highlight the report from the panel on the pre-selection (shortlisting) for the ECOC in 2020 in Croatia. A UK city will be the European Capital of Culture in 2023. It will share the title, and work with, a city in Hungary. 2023 may seem a long way off but cities thinking of bidding should be starting their preparations now. The bids will need to be completed in mid-2017 for shortlisting. The final selection, based on revised bids, will be in 2018. So far Leeds and Milton Keynes appear to have set up bidding teams; will more join the competition? Dundee will decide to bid in September. Cardiff may put a bid together. These are leaving it very, very, late to put a bid together. Many recent ECOCs have spent 3-5 years before the submission of the bid. Why the long time? Because it is no longer a top down application which can be prepared by a city administration and a few cultural operators. The criteria require extensive consultation and participation in the development of the bid. Not just marketing or convincing people but actively seeking views and acting on them. This poses a challenge to city administrations and as importantly to the cultural sector in a city. In essence a bid says “we are not satisfied with our cultural offer and we seek to transform our city through culture (and other sectors). Putting a programme together also involves considerable visits to other ECOCs and in finding partners for projects across Europe (and beyond). An ECOC is not a big celebration of the present but a transformational programme for the future. They, and other cities considering bids may find the report on the pre-selection of the ECOC in 2020 in Croatia useful. It is the first report based on the new criteria for ECOCs from 2020. Four cities, out of 8, were shortlisted. As the current chair of the Selection Panel of the European Capitals of Culture (ECOC) I see bids from candidate cities in many countries and all start their bid preparations well in advance. Many spend five or six years preparing their bid, well in advance of the official announcement. A key point to notice is, of course, this is the EUROPEAN Capital of Culture.. not the UK City of Culture title successfully held by Derry-Londonderry in 2013 and awarded to Hull for 2017. That competition was part of the legacy of Liverpool becoming the last UK city to be awarded the ECOC title, in 2008. The criteria at European level are different to the UK version; they are also different from the ones used to select Liverpool (let alone Glasgow’s ground breaking programme in 1990). The selection process also differs to the UK City of Culture. The Culture Ministers of the 28 EU member states have recently agreed the new programme and the European Parliament have also completed their formalities. The formal “Decision” will be published shortly. There is a preview later in this post. So what does a candidate city have to focus on? Well each city will be different; it will have its own objectives and purpose. There is no single magic template which guarantees a successful bid or programme. The title is not awarded simply because a city is in the UK (and still in the EU of course). A city’s size is not relevant. Nor is its cultural heritage a major factor. An ECOC is based on a future programme and not a celebration of the past. Successful cities integrate the standard selection criteria with their own local objectives. The “legacy” is important: what are the longer term outcomes? In recent years the budgets for the ECOC programme have varied from €20m in the smaller and newer EU member states to between €50 and €80m in western European countries. The money is spread over the five or six years of the overall programme. This is on top of the usual cultural budget of a city and excludes any infrastructure or new buildings. Several recent ECOCs have successfully bid for EU regional funds for culturally related projects (mostly linked to cultural tourism). Most ECOCs build up to a management team of 40-50, plus hundreds of volunteers. The first criteria is that a city must have an existing cultural strategy even before it can bid. The ECOC is not a one year “super-festival” but needs to be part of the overall cultural development of a city which in turn is part of a city’s strategy. This is one of the reasons potential bidding cities may need to start soon, developing their city’s cultural strategy takes time. Four criteria will be familiar to cultural managers: outreach (including the involvement of citizens in the development of the bid), management, the capacity to deliver and a high artistic and creative content. “Culture” in the context of an ECOC has a wide interpretation: all artforms from djs to opera, new media, community and participatory arts, arts in schools, hospitals, languages, creative industries etc. The focus is on the programme which normally progressively builds up to the events of the year. The programme needs to be additional to the existing cultural offer in the city (as is the programme budget). A common and crucial feature is that it is a highly international programme. Some ECOCs have an international aspect to virtually every project or event or base their programme around European themes. The remaining criteria is the one which marks the ECOC out from national cities of culture: the “European Dimension“. The programme must highlight the cultural diversity of Europe (to the cities own citizens and not using the title solely as a tourist/city branding exercise), highlight European themes and the common aspects of European cultures, heritage and history. This is a challenging criteria and one which is of major importance. Recent ECOCs have developed a wide range of imaginative projects to meet this European Dimension requirement. What should cities thinking of bidding do now? My advice is to go and visit the two current ECOCs, (and those already selected for 2015 to 2018) to learn. There is a wealth of good practice, and lessons to learn and share. Riga and Umea hold this year’s title and are in full swing. In 2015 the title goes to Mons and Plzen; in 2016 to Donostia San Sebastian and Wroclaw; in 2017 to Aarhus and Pafos. In 2018 Valletta and Leeuwarden share the title. Several of these ECOCs have their bid-books (in English) online. All are working hard to develop their programmes. Later this year the Selection Panel will recommend the cities in Italy and Bulgaria for the 2019 title. There were 21 candidates in Italy and 8 in Bulgaria. There are now 6 on the shortlist in Italy and 4 in Bulgaria. Read the Panel’s reports on the pre-selection shortlisting. There are clear short-term and long-term benefits for a city holding the ECOC title. These are outlined in the recent report commissioned by the European Parliament from Beatriz Garcia of Liverpool University. Recent holders of the title (eg Marseilles-Provence,) are in no doubt about the success of their programmes. Many cities which were not successful in the competition find they have made significant gains: the bidding process in itself was more than worthwhile. Who will bid for the title when it comes to the UK? I’ve no idea but now (June 2016) is the time to be deeply into preparing the bid. Good luck to all the candidates! The William Morris Gallery in Walthamstow won the Museum of the Year award in 2013. The prize was twofold: a significant amount of free PR and marketing which has led to a massive rise in visitors and £100,000. The prize came after a total refurbishment. So what happened? Nothing: no news on the website, no news in the Council’s free PR paper. Silence. For six months. Time enough for a decision perhaps? current glazing prevents effective viewing of the paintings in the Gallery, especially the larger Brangwyn paintings. The worst affected painting, Brangwyn’s Dogana, has already had its glazing replaced and we are seeking quotes for other works. Other suggestions that we are investigating include – replacing the benches with chairs in the tea room so that families and older people find access easier, more equipment to control the temperature in summer months and a buggy park. arts (due to launch in 2014). receive Heritage Lottery funding to support this programme, until November 2014. So there we have it. The Gallery has now been nominated for the European Museum of the Year award. (a Council of Europe project, not the EU this time!) It is in illustrious company. Good luck! And please go along to the current exhibition of Jeremy Deller last shown at the British pavilion at the Venice Biennale last summer. Local democracy in Walthamstow or will the gambling giants win again? William Hill Organisation, one of the largest betting and gambling companies in the UK (excluding the banks of course) want to open a new betting shop in the area. The local residents signed a petition to oppose. The local council’s planning committee agreed with them and turned down the application. Predictably William Hill have appealed. A few months ago Newham Council did the same; they lost on appeal. The new style betting shops are proliferating across the UK, along with payday lenders. Gambling Watch UK warns of a generation of younger gambling addicts. Another report questions their link with problem gamblers. Will the same happen in Walthamstow? Here are the points I’ve made arguing against William Hill and supporting the Council. not want to lose a retail space nor gain another betting shop in the area. Betting shops are no longer the betting shops of old: the shop for the flutter on horse and greyhound racing. Their main income and rationale is now gambling, more suited to casinos and the controls which apply to casinos. Fixed Odds Betting Terminals will be installed by the William Hill Organisation should their appeal be successful. They are aptly described as the “crack cocaine” of gambling. These have no place in our neighbourhood which already has an over-supply of gambling/betting outlets. in a relatively poorer area of London is a sign, along with the payday lenders and pawn brokers,of the ability of the financial services industry to prey on the weakest. The location is along the route taken by many young people attending the Waltham Forest College who catch public transport at the Hoe Street/Forest Road crossroads. Putting a betting shop in their path conveys the wrong signal to them. Walthamstow, like so many urban centres, is struggling to maintain vibrant and productive high streets and areas. The loss of a retail unit in the cluster of shops around Hoe Street/Forest Road is an unwelcome step. The proximity of the William Morris Gallery, now recognised as Museum of the Year 2013, the renovation of Lloyd Park and of the Bell public house into a family-centred pub, are steps in the positive direction for the regeneration of this area. A betting/gambling shop is not. Will Eric Pickles, the Secretary of State for Local Government support local residents, or will he side with big business? Send your objections, quoting APP/U5930/A/2199214 to teamp1@pins.gsi.gov.uk saying you oppose the appeal by the William Hill Organisation (address of proposed new betting shop is 520/522 Forest Road, Walthamstow). By midnight 5 August!!!! I am sure that this will not the last time a gambling company will seek to open a new outlet in Waltham Forest so keep your eyes open and be ready to organise! What would you do with £100,000? Yes, there is a catch. Not a windfall of £100,000 for yourself. I mean the £100,000 prize money awarded to the William Morris Gallery in Walthamstow: the 2013 ArtFund Museum of the Year. Fine words and indeed credit does go to the Council for reversing their original decision on the future of the Gallery and embarking on its marvellous renovation. I have a major concern with Councillor Robbins’ statement. It’s that term “we’re”. Who are the “we”? Experience across Europe has shown that decisions about the detail of cultural projects are not best handled by politicians. This Gallery owes its current status to the energy of those who campaigned to keep it open. Surely residents of Walthamstow, and “Morrisians” further afield, should be invited to contribute to and be part of the discussions? Readers of Private Eye over the last few years have seen examples of less than transparent decisions and accountability by the Council. We must not let any suspicion of this apply to the £100,000 prize fund. I suggest that Councillor Robbins arranges a public meeting in the Assembly Hall (with its Morris inscription over the entrance) and calls for open contributions on the use of the money. I am sure he would attract a large audience and a range of practical and imaginative suggestions. We know we can fill the Assembly Hall, as local citizens did to help save the EMD Granada cinema. I am sure ArtFund judges such as historian, and MP, Tristram Hunt would give us their views. The Friends of the William Morris Gallery have a key role. A public celebration of the prize and a forward looking debate. A second stage would be to co-opt as non-voting observers several members of the local community to the appropriate Council committee which will be discussing the practical plans. A third step would be a regular public updating on the William Morris Gallery website of progress, of options, of why certain proposals have been rejected, of how the money is going. Openess being the watchword. Yes I’m biased and declare an interest: a local resident, a member of the ArtFund (good value for money!) and I have many books by and about Morris on my bookshelves. William Morris was an indefatigable public speaker, taking his views across the country and speaking directly to citizens. A good model for the Council to adopt now. Power to the people: from closure threat to Museum of the Year. A campaign which started local and went global, has finally paid off. Six years ago Waltham Forest Council planned to close the William Morris Gallery, in Walthamstow. Now the gallery has won the Museum of the Year 2013, an award worth £100,000, and organised by the ArtFund. Congratulations are flooding in. They are well deserved. The renovations have transformed a fusty, dark and quite frankly unappealing building into an informative, bright and attractive survey of Morris and his myriad interests. The obligatory cafe is a nice touch as well. Many photos on google. ” in the current climate it’s amazing to see a local authority realise the power of art in regenerating a borough”. Other reports have made a similar point. Fair enough; Waltham Forest Council did provide £1,500,000 towards the work (around 30%) and will run the Gallery. Good news for all who believe in the important role the arts can play in local well-being. But it was not always this rosy. Six years ago the Council wished to close the Gallery, merge its priceless contents with a museum in South London and be shot of the whole affair. They wanted to save £65,000. Unbelievably they had tried to do the same in 1987. What changed their mind? A very active campaign which gained world-wide support. A petition signed by 11,630, demonstrations (it was cold! ): citizens actions. An active Friends group was formed in 1987 lobbied. The Council changed its mind. Now the new Gallery has attracted over 100,000 visitors in less than a year from its re-opening. The Museum of the Year prize will bring in far more. So it is congratulations to the local councillors.. for listening to their local citizens. As well as the standing collection the Gallery has already hosted exhibitions by Grayson Perry, David Bailey, modern crafts and in 2014 becomes the first gallery in the UK to host Jeremy Dellers’ current exhibition at the British Pavilion in Venice. 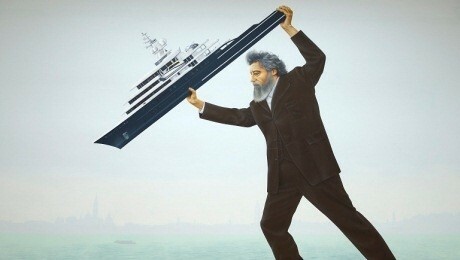 That features William Morris rising to hurl Abramovich’s monster yacht into the lagoon. With the arts in financial trouble in most of Europe it is a little bit of good news on the power of campaigning. William Morris, socialist, would have been pleased. In a years’ time citizens in the European Union will be at fever pitch as they prepare to vote in the elections for the European Parliament. Well perhaps not at fever pitch! Turnout at these elections has been declining in most member states. In only 9 countries in 2009, the last election, did half the voters cast a ballot. Apathy and indifference were stronger contenders. 2014 may well turn out to be markedly different. The European Parliament now has real powers. Under the Lisbon treaty, it is no longer a wasted vote or a missed democratic opportunity. Members of the European Parliament have already shown they can alter proposals from the European Commission and from the inter-governmental Council. The 2014-2019 European Parliament will feature far more in our news than its predecessors. But who will be in the Parliament? At the moment it is dominated by four main political groupings: the Christian Democrat EPP, the Socialists and Democrats, ALDE. (liberals) and the Greens. All pro-EU and used to working in “the spirit of the EU”. Of course they all have a few mavericks but generally they work comfortably together. With well over 70% of the members they control the Parliament. But will this be the same after next years’ elections? The current political climate across the EU suggests otherwise. A feature of recent elections and polls in member states has been the rise of parties not affiliated with the big 4 at European level. Golden Dawn and Syrizia in Greece; UKIP in the UK, Grillo’s M25 in Italy. A new party will contest the German elections in September (pro-EU, anti Euro). Opinion polls in Spain show a breakdown in support for the two main parties with the left and centre gaining. Concurrently there is increasing support for the 15-M movement. Logic dictates that voters in Portugal, Ireland and Cyprus may not look too kindly on pro-EU candidates next year as the EU takes the blame for the austerity measures (and you can’t vote for the IMF). The far right-wing parties also seem to be gaining in popularity with their anti-EU, xenophobic, reactionary rhetoric. The True Finns, Swedish Democrats, Le Pen’s Front National.. the list, goes on. In the UK, sadly, it seems to be a given that UKIP will be the largest party in the May 2014 elections. If nothing else the noise from the far-right drags the centre of debate even further to the right. Already alarm bells are ringing in Brussels. A European Parliament with a substantial minority being anti-EU or at least anti current policies? Indeed it is not too difficult to forecast a blocking minority (although the chances of all the “minority” parties agreeing on anything is remote). The political parties are preparing. Gossip abounds about who from the in-crowd will get the top jobs. But outside of party politics there are several attempts to influence and mobilize opinion before the elections. At its borders, in a Mediterranean political and social transformation, Europe is experiencing a strong migratory pressure from its neighbours and more distant countries. Inside, the moral, social and economic crisis leads us to retreat, promoting the growth of xenophobia, nationalism or simply mistrust vis-à-vis foreigners (whether EU or non-EU ). How are we to consider the prospect of the European population’s decline in this major contemporary tension if we do not accept more than 55 million foreign workers in four decades? How should the cultural and civic dimension be taken into account in international relations, especially with countries of the Mediterranean basin? the publication of a manifesto by the participants in the “états généraux” meetings and other interested parties, incorporating elements relating to the values, culture and history that represent the connecting link between Europeans, in order to develop a vision for Europe which can be adapted to the current challenges such as solidarity, strengthening the democratic legitimacy of the EU and the role of Europe in the age of globalisation and interdependence. These initiatives are to be welcomed. But are they enough and will they tackle the hard issues of today? It is noticeable that none of the meetings in the three projects will take place in a country under a EU/ECB/IMF bail-out regime. Not perhaps a good message to send! Trust in the six largest European Union member states as a basic concept is declining. When economic times are tough solidarity with fellow Europeans declines. Yet virtually all the solutions on offer, including those based on culture, seek greater Europeanness, More Europe. Jurgen Habermas and Zygmunt Bauman have weighed into the debate about the limits of solidarity, the rise of populism and the risks to the European project. The Trade Unions are calling for a Social Europe as a way of going beyond the economic focus. The key test for the Cultural Coalition, the Citizen’s Summit and the New Narrative is to move beyond the cultural cosmopolitan, the “educated urbanists” in marketing jargon. I’m assuming that the participants will not use the projects to press for their own sectors’ financial case. Lobbying has its place: this is not that place. There have been many fine sounding declarations of the importance of culture in Europe, how culture is at the heart of being European and how culture can support the European Union. (This last assertion is the hardest to sustain). I hope the initiatives do not come up with more of the same, however well-intentioned. The economic austerity in many countries in the EU, the threats to free movement of people (but not it seems capital), the failure of many austerity programmes, rising un-employment (and under-employment) change the context. Those previous declarations have appealed to the committed Europeans in times of plenty. Now is the time to send a positive message to those less than committed to a European Union. It is probably too late for the projects to change their programmes but they surely must hold meetings away from the Brussels/France/Germany nexus. It will soon be EU-28 but you wouldn’t notice it. For a young generation for whom the war is sepia-tinted history and neoliberalism offers only insecurity—including in some countries a more than even chance of being unemployed—’Europe’ therefore now holds no meaning except Erasmus programmes for the educated elite. This chimes with a major report on Youth Participation in Democratic Life, which should be required reading in all three projects. The research looked at youth (13-30 year olds to match the EU’s Youth in Action programme) in six countries (Austria, Finland, France, Poland, Spain and UK). The report calls for major changes to remove poltiical and cultural barriers to increased youth participation. Given the overwhelming levels of perceived betrayal, distrust, scepticism and/or anger expressed with regard to politicians by 95% of our focus group respondents from “reference”, “active” and “excluded” in all six countries and the survey results that point to a political offer that is often perceived as inadequate, this seems to us to be an immediate and significant challenge and action point. A challenge indeed. Let’s see how they respond. At the time of writing it is unclear how the Cyprus “bail-in” crisis will be resolved. Regardless of the ending it is clear that a modern Rubicon has been crossed. It has been a tenet of faith since the financial crisis exploded in 2007 that the money people have in banks, up to EUR100,000, is safe. Taxes may be raised, public sector jobs and salaries cut, public services reduced or sold off but banks can still be trusted to look after people’s’ money in their bank accounts. “Savers” are now “lenders to banks”. The initial terms of the Eurozone “solution” of Cyprus’ banking problem has blown that tenet apart. It seems that finance ministers, EC officials and the IMF have decided that bank accounts are no longer safe. Some are hastily backtracking once they see the public anger but too late: they did say “cross the Rubicon, it’s only a little stream in little Cyprus”. The details, still being debated whilst I write, are irrelevant. The European Union prides itself on being a union of values. The claim is a fixture in many documents from all of the Brussels institutions: Parliament, Commission, Council (and the Bank in Frankfurt). The initial terms of the Cyprus “deal” break a fundamental value: that of trust. I think that the Cyprus “deal” is a watershed. Across the EU more and more people are becoming angrier, more cynical, and more distrustful of those in power. Dissent is moving from the fringe nearer the centre, the mainstream, perhaps not now but slowly and progressively. 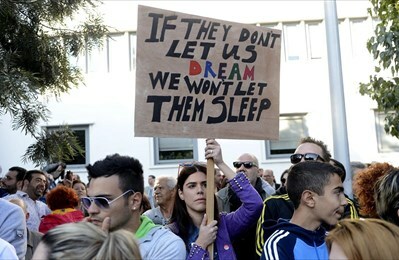 One of the posters at a demonstration in Nicosia read “If you don’t let us dream, we won’t let you sleep“: the title of a recent play at the Royal Court Theatre in London. It marked a return to overt political theatre. The play may not have hit the heights of theatrical drama but the message and intent was clear. The cultural sector often claims for itself that it challenges the status quo, that it triggers a deeper look at our society and current beliefs. In reality the overwhelming output of the creative and cultural sector does nothing of the sort. But in times of crisis, when basic values are under threat, it is promising that some parts of the creative world can present a strong reflection. It is surely a time when culture, the arts, needs to challenge the economic basis of society, a return to collective values rather than the intensity of challenging individual identity. There are calls for a new European Union. They vary from one based on a cultural concept, or led by and for citizens or a social Europe. They have in common a demand for a fundamental change in direction, a rejection of the pure market led society and ideology now prevalent. Ken Loach’s film “Spirit of 45” records the transformation of British society after the Second World War; a social transformation slowly dismantled from Thatcher onwards and being rapidly dismantled by the current UK government in the name of austerity. It is not just in the UK. The film highlights the poverty of the 1930s. There is a telling shot of a poster “Starving men fed daily”; the film ends with a queue at a food kitchen in Walthamstow in 2013. Recently the leading Labour Party politician charged with drafting the new party policy said that he believed food kitchens will remain with us, (and not just in the UK). Leadership? Progress? A warning? 2013 in the EU has been marked by a succession of comments, speeches and plans based around the false idea that the European Union welfare state concept, the social market, can no longer “compete” in the world increasingly dominated by Asian societies paying little attention to welfare of their citizens. If there was a time for a cultural European Union, a citizens’ European Union, it is now. Both need to reject the current direction of politicians; it is not a time to tinkering at the edges or for confusing lobbying for more money for the arts with a need to change the ideological direction. It’s November and the conference season in full swing across Europe. Austerity and cuts may be the dominant reality but Europe’s cultural cosmopolitans have their boarding passes at the ready. The ever-welcome newsletter of the Platform for Intercultural Europe (PIE) sets the scene. Conferences in Belfast, Brussels, Turin, Vilnius, Helsinki, Brussels (again), Cosenza, and Kobuleti; and that’s just November. Amidst this cornucopia of lanyards, name tags and lost luggage two themes emerge, the ever-changing make-up of European societies and how “culture” can, or should, solve Europe’s problems. I’m sure that participants in all these events will come away energised with new ideas, some which may be put into practice. My own more limited hope is that conference organisers put as much as possible onto their websites after the event. It is so frustrating to read the programme, perhaps read some advance papers, and, then, nothing more. (advance #Hashtags also useful!). The Platform’s newsletter goes some way to open up one series of meetings. The European Commission’s use of expert groups has come under criticism recently from the European Parliament. The PIE reports on a meeting in Brussels of the “Open Method of Co-ordination” .. an expert group on “Cultural Diversity and Intercultural Dialogue”. It’s a comprehensive report: just as well as I can’t find any formal minutes or names of members. “Open” clearly does not mean “public” which is a shame in today’s more transparent requirements of governance. I was taken by Chris Torch’s expert paper prepared for the meeting in which he gives an overview of migration and poses some ways forward for the arts sector to address social cohesion and diversity issues. A sound paper but one I felt stopped short of proposing the radical changes needed. It seems the OMC meeting itself also took the easy way out with its interim view that arts organisations should perhaps carry on as usual and merely add some additional “community” arts to their programmes. The EU prides itself on its “Unity in Diversity” but nowhere more so than the ways member states deal with their own citizens and residents in their countries. This point was raised at the meeting by representatives of member state governments. The Torch paper underplays the wide nature of “migrants” weakening many assumptions and recommendations he made. There are, post 1945, four main waves of migration, loosely described as “guest worker”, post colonial, economic and intra-EU free movement. Western Europe has seen the four waves, in different mixes, from the 1950s. The newer member states in Central Europe had a long period of increasing mono-culture and a more recent and shorter experience of both emigration and fluidity. Countries with a history of being emigrants themselves now find themselves receiving migrants. In many countries migrants, as in newcomers, are outnumbered by second and third generation citizens, no longer migrants nor should they be considered as such. Racism not migration is the issue. Each country has a different mix based on their own history. I found both the Torch paper and the report on the meeting too timid in their views. The hard topics are avoided: religious and cultural differences, the rise of overt racism (in Greece for example with Golden Dawn, in Hungary etc). In short: the policies and practices of the last decade do not seem to be working. More of the same is not enough. What was missing from the Torch paper and it seems from the OMC is the realisation that change is needed within the arts and creative industry sectors, as employers of managers and artists. Adding activities on the margins of the mainstream is not enough. These arts sector orientated debates are followed two weeks later at the Brussels Conversations on a Cultural Coalition for a Citizens Europe, discussing “the future of the European project and the citizen’s role in making it a reality”. A brave aim when many are questioning the very concept of the European project. Was the Nobel Peace Prize the final accolade for the project now it has achieved its original aim of ensuring enduring peace between France and Germany? I do like the conference proposition that “The lectures and workshops in this encounter will move beyond the theoretical-legal-philosophical discussion and show that citizenship and its cultural component is something we should practice in our daily lives”. 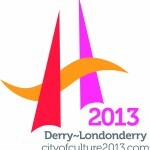 Derry-Londonderry, the UK’s City of Culture in 2013, has announced its programme. Derry won the title after a competition with 15 other British cities; selection was by an independent panel. ” It is a privilege to have received the baton from the amazing festival that was London 2012 and to be carrying on the legacy from Liverpool 08. We in turn will pass the spotlight to Glasgow 2014 and the Commonwealth Games and the next UK City of Culture in 2017. Derry~Londonderry in Northern Ireland will play host to a world-class programme which includes the Turner Prize presented outside England for the first time; a new commission by the London Symphony Orchestra; award-winning choreographer Hofesh Shechter; the return of Field Day; a new play by American playwright Sam Shepard; local Nobel Prize-winning poet Seamus Heaney; and the first visit to Northern Ireland of the Royal Ballet for over 20 years. As well as the cultural events the Derry2013 programme has extensive projects with schools and community groups. Syrian writer Samar Yazbek has been awarded the Pen Pinter award for Writer of Courage on the nomination of Carol Ann Duffy. Yazbek, now in exile in Paris, writes about her experiences in Syria in “A Woman in the Crossfire” and was in discussion with Peter Clark at the Frontline Club in July. Writers capture the essence of place and time. The tragic events in Syria are underreported by the media. Daily the government is killing protestors seeking nothing more than freedom. As with the other North African and Arab countries Syria is showing what happens when trust breaks down within a country between the leaders and the people of a country. Egypt and Tunisia have started the long slow path to normality. Syria has not. Yet. Assassins are taking over both humans and places, and they are terrorizing people. They come to the homes of our neighbours, telling them that we are about to kill them. Then, they turn back at us crying: They will kill you! I am the accidental visitor to this place. I am the improvisation of life. I do not belong to my own community.